58 offices in the United States, 2 in Canada, and 1 in Abu Dhabi. In 1915, Gannett Fleming was first founded as Farley Gannett Consulting Engineer in Harrisburg, Pennsylvania. The evolution of the automobile and the need for ways of transportation made it possible for the company to develop and grow at a rapid pace. The company was chosen to design sections of the Pennsylvania Turnpike, a highway that was used as a model for many others. Gannet Fleming is recognized for the design of wastewater treatment, solid waste disposal, air pollution control facilities, flood control, and mainly in the transit systems of the U.S. Currently, the company has more than 2,100 employees with offices in the United States, Canada, and Abu Dhabi. Their work can be found in all 50 states and in more than 50 countries. David Evans and Associates Inc., Portland, Ore.
Arizona, California, Colorado, Idaho, New York, Oregon, and Washington. Total of 21 offices in the United States. David Evans started David Evans and Associates, Inc. (DEA) in 1976. He wanted to offer his clients freedom and support to pursue their ambitions. 30 years later, DEA is a leader in sustainable design and management solutions. DEA has ranked among the top 100 Pure Design companies in the United States and has been awarded for their innovative approaches to energy, water resources, land development design, and transportation. AMEC has 325 offices in around 40 countries. Around 104 offices in the United States. Matthew Hall opened his first office in the UK in 1848, which became the Matthew Hall Group of Companies. In 1883, Leonard Fairclough started Fairclough Construction in the UK. Fairclough Construction merged with William Press (founded in 1913) to form AMEC. Six years later, Mathew Hall Group of Companies became part of the AMEC group. In 2000, AMEC bought AGRA, a Canadian engineering company with over 85 years of experience. In 2002, AMEC was recognized by the Dow Jones Sustainability Index “as one of the world’s top five companies for sustainability in the oil equipment and services sector” (http://amec.com/aboutus/past.htm). In May 2011, AMEC acquired the leading US engineering and environmental services company MACTEC. In 1968 Wolf D. Prix, Helmut Swiczinsky, and Michael Holzer founded Coop Himmelb(l)au in Vienna, Austria. Wolf D. Prix began studying architecture at the Vienna University of Technology and completed his studies at the Architectural Association of London and the Southern California Institute of Architecture. Helmut Swiczinsky started his studies of architecture at the Technische Universitat and continued at the Architectural Association of London. Prix and Swiczinsky were the leading members of the firm and in 1971 Michael Holzer left the team. In 1988 they formed Coop Himmelb(l)au LA / Cloud Inc. LA. Between 1996 and 2006 Karolin Schmidbaur, Wolfdieter Dreibholz, Harald Krieger, among others, joined the firm. In German, Coop Himmelb(l)au means “Blue Sky Cooperative” or “Sky Building Cooperative”. 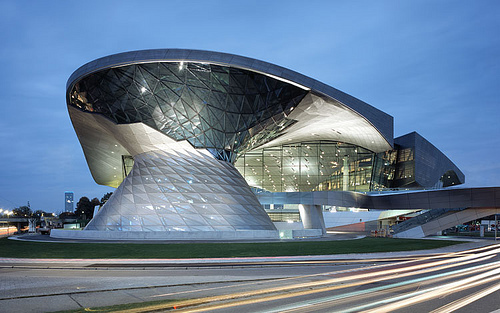 Coop Himmelb(l)au is an example of Deconstructivist architecture that began in the late 1980’s. “By breaking continuity, disturbing relationships between interior and exterior, fracturing connections between exterior and context, Deconstructivism undermines conventional notions of harmony, unity, and apparent stability” (Stevens, “Deconstructivism”). The designers tend to create assymetrical and unconventional structures with non-rectilinear shapes that are considered as part of a postmodern architecture.